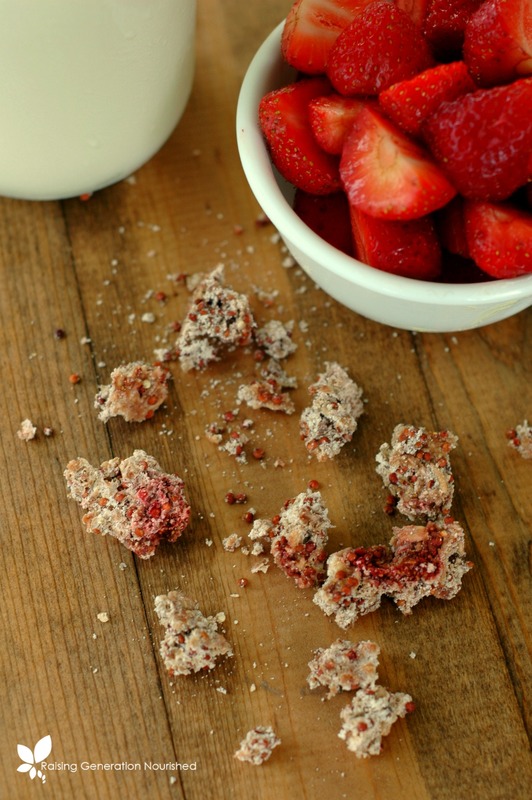 Crispy, crunchy and swirled with sweet strawberries! 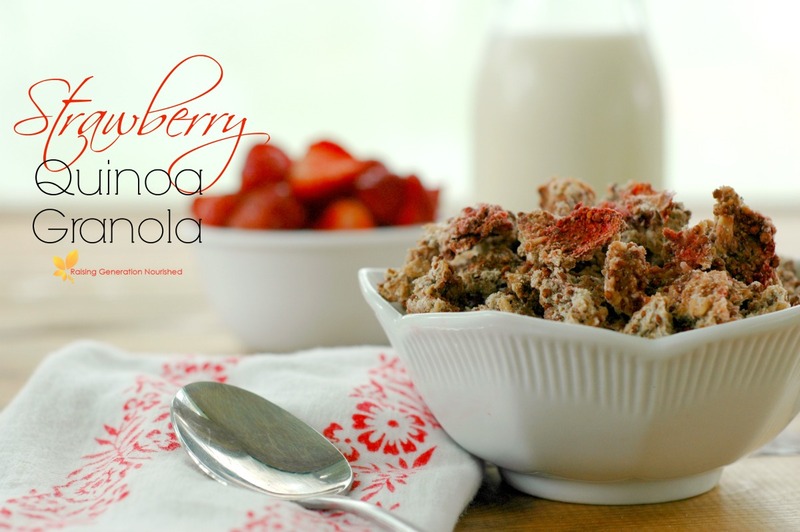 This is one granola that I dare to put up against any boxed cereal in taste! 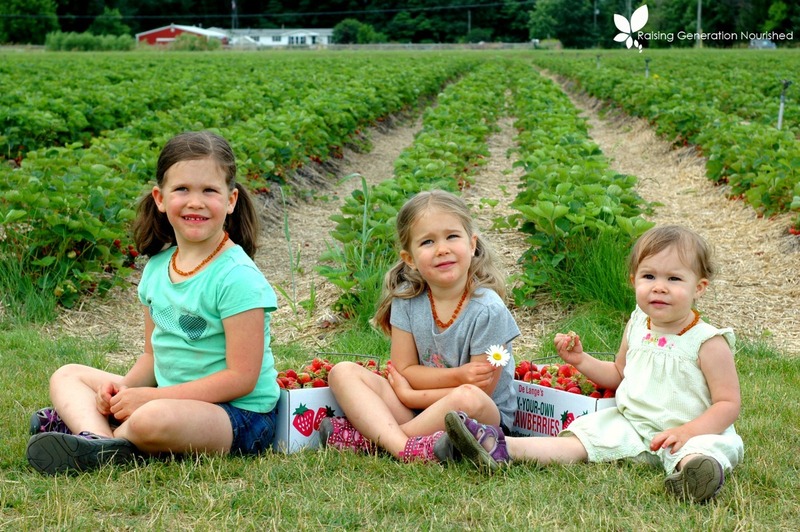 Last weekend we celebrated strawberry season in Michigan! 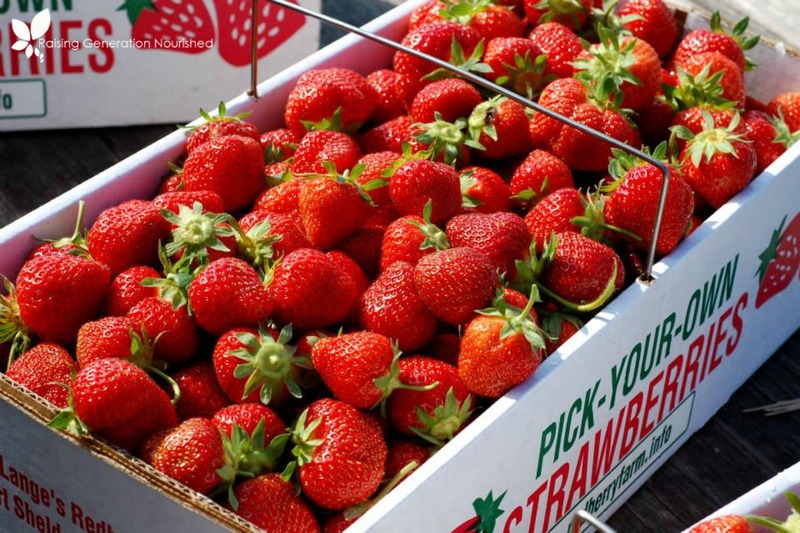 I don’t know that Michigan is the first place that people think of when they think of berry season, but in all actuality, it is a great climate for many berry growers – especially strawberries, blueberries, and raspberries. We grow raspberries in our backyard with the greatest of ease – there is something about the lakeshore climate that is just perfect for growing summer berries is what I have been told! 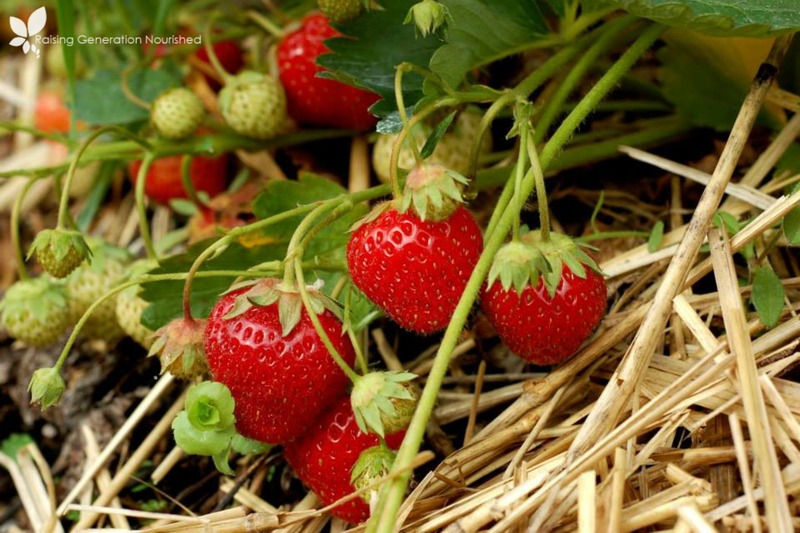 And after the winters we have to endure, I would say being rewarded with some of the sweetest strawberries you have ever tasted is definitely due! This year I kept things pretty simple and very useful with our 30 pound load. 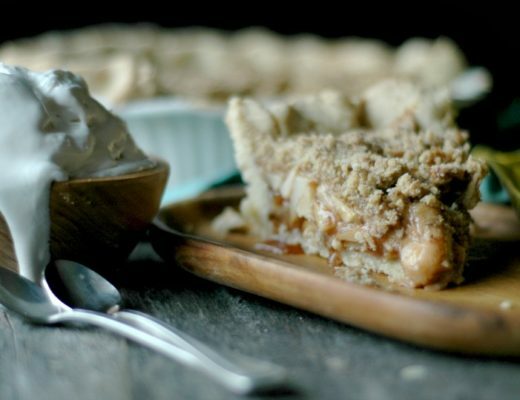 No fancy desserts for me this year – I need functional to keep my sanity right now! I froze the majority of it for smoothies, yogurt, and oatmeal during the school year. I kept a few pounds in the fridge for us to eat this week. And I poured some pureed strawberries into my popsicle molds to stash away for this summer. 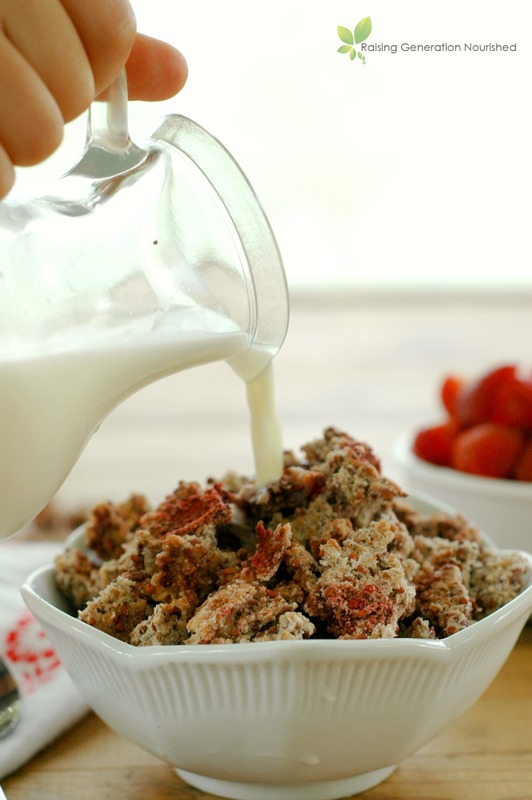 Strawberry granola was on my functional uses for my strawberries as well. 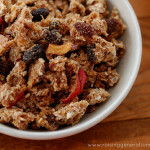 Granola is nice for cool summer breakfasts – and don’t even think I’m not already thinking about those first weeks of school coming up at the end of August! 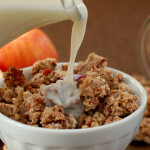 Granola makes a great breakfast for busy mornings too! 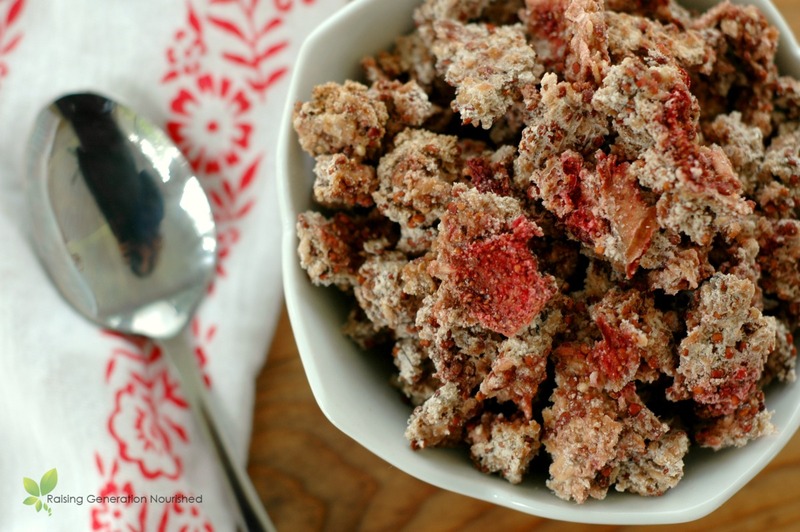 Last year I created this grain free strawberry granola for my friend Jessica over at Delicious Obsessions – and it went FAST! The girls loved it – as did my husband and I. This year I decided to try some different ingredients to switch things up. 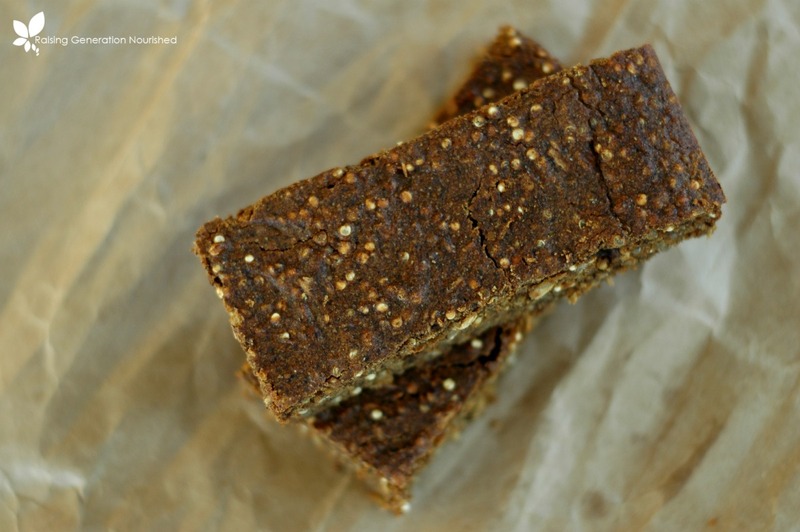 It isn’t grain free this time, but the grains and flours I chose had specific purpose – nutrient dense and filling! The girls have been sneaking handfuls here and there over the last week and it really turned out so good! If you can’t or don’t have access to raw milk for pouring or whole yogurt, you can use coconut milk or coconut yogurt! 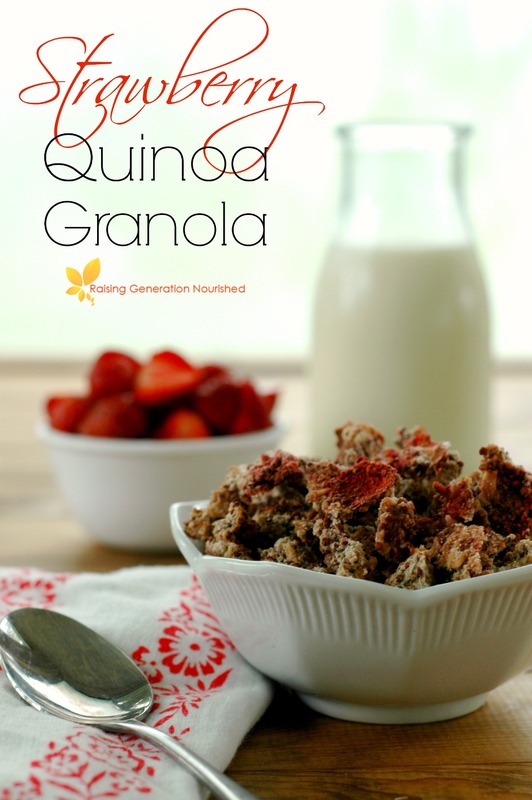 Granola also packs up great for school lunches – the kids can sprinkle it into a cup of yogurt or just eat it by the handful. 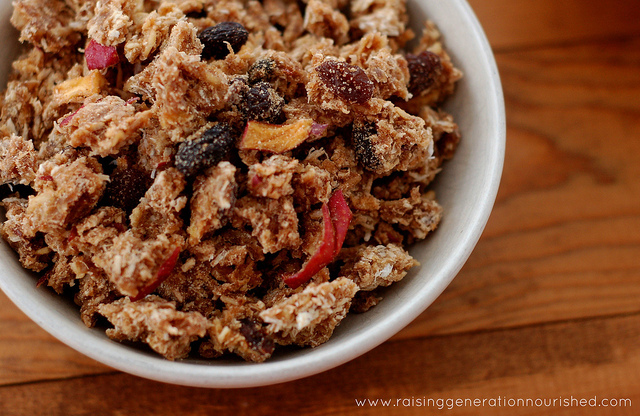 I frequently pack a handful of granola for a snack for my preschoolers school snacktime. A quick note on dehydrators! 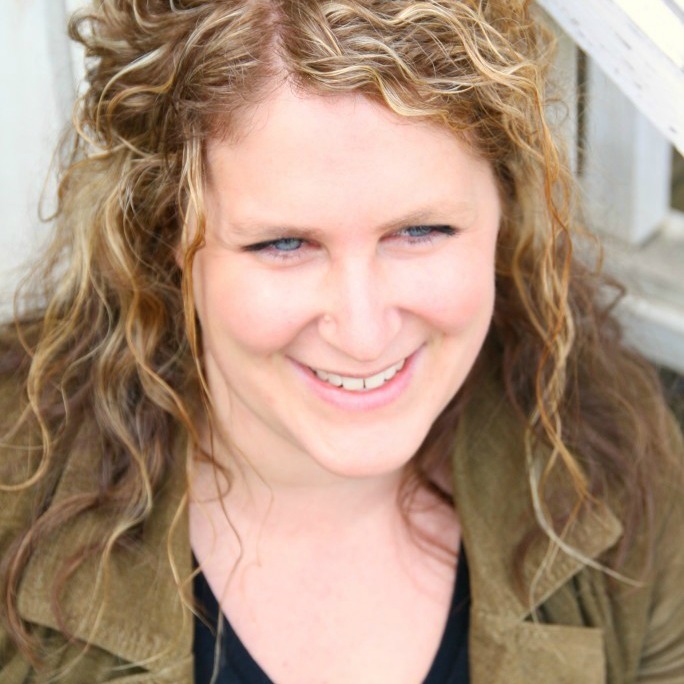 I have a simple, middle of the road dehydrator and I really love it – it gets the job done very well! I have quite a few extra trays that I stack up and I can do pretty large batches. If you don’t have a dehydrator, you can oven dry or oven bake – there are instructions for this in the recipe below! 2 cups quinoa I get the linked brand at Costco - the regular color or the red quinoa work fine - I used the red this time! 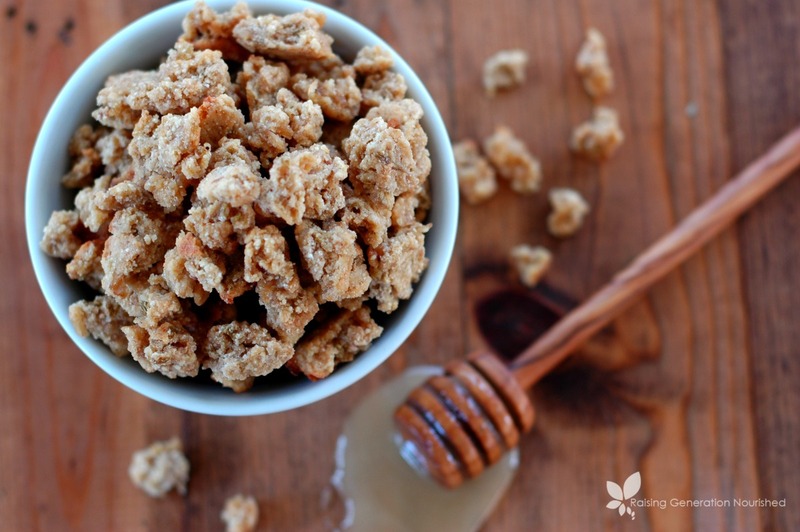 1/3 cup raw honey If your kids are used to a much sweeter cereal go ahead and double this. I get mine from a local farmer. If you don't have access THIS is a good brand. Put the oats, quinoa, and lemon juice in a large mixing bowl. Add water to cover the grains, combine, and let the mixture soak 8-12 hours. This soaking process breaks down phytic acid in the grain, makes it easier to digest, and makes the nutrients more available to absorb! After the grains have soaked, drain the liquid and return to the mixing bowl. Add the rest of the ingredients and combine. Spread onto your dehydrator trays and dehydrate at 135 degrees overnight (Or over the course of a day. I tend to soak during the day and dehydrate overnight). If you are using an oven you can set your oven at the lowest heat and stir throughout the day - or you can go at a higher temp and bake it off, again stirring often until it dries out. 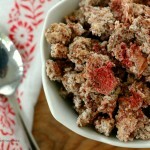 Once the granola is dried out you can crumble it into containers for storage. 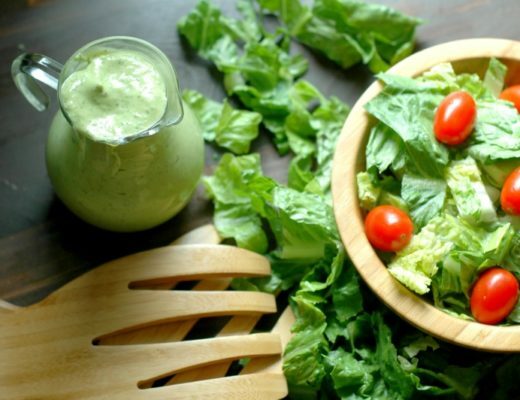 Paleo Ranch Dressing and Dip :: Dairy Free, Egg Free, and Filled With Healthy Fats! You said to stir throughout the day if dehydrating in the oven…is it spread out and I am moving it around or is it in a bowl? 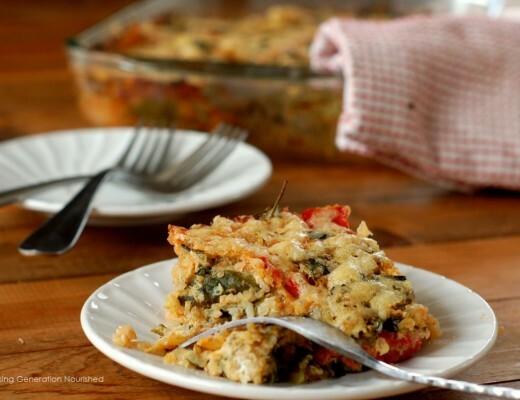 Spread it out onto a baking sheet or 2! Sorry for not clarifying that! Hi Jeanne! The whole mixture is a little more “wet” because of the soaking step. 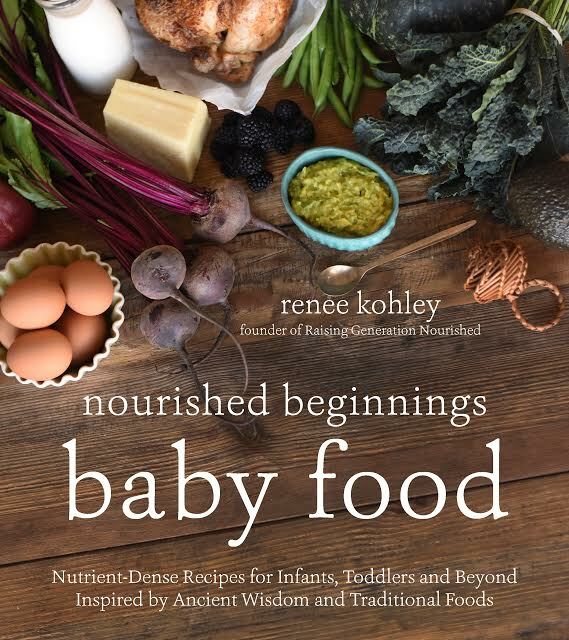 The soaking makes the nutrients in the grain more available to digest along with making the grains easier on the gut to digest. You can certainly bump up the oven temp and bake it hotter for a faster time though! I throw it in the dehydrator because it is less hands on time and because the low temp keeps the raw properties of the raw honey etc. 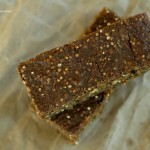 But before I had a dehydrator I absolutely used my oven and would do a higher heat for shorter time to make it faster! Wow this looks yummy! 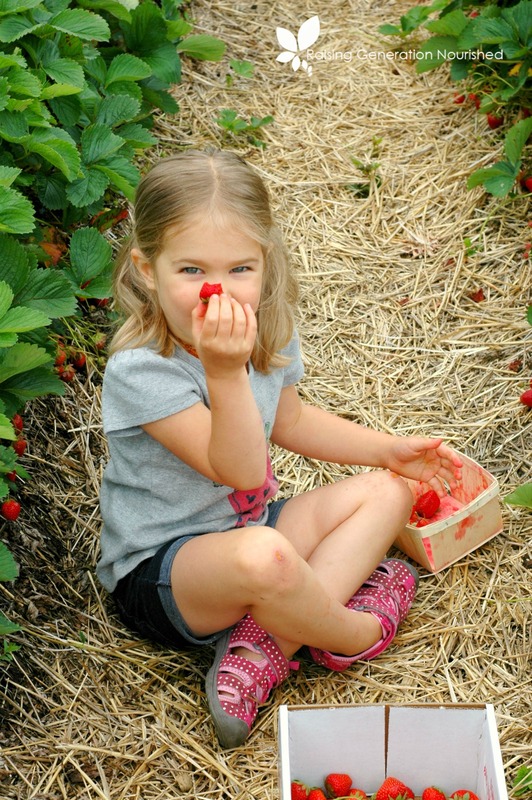 Our family loves doing you-pick for berries. Do you think I could substitute more almond flour instead of coconut flour? Do I need to cook the quinoa first or will it soften just from being soaked? You don’t need to cook it Laura! 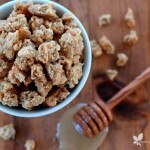 It will plump up while soaking and them get light and crispy when dehydrated! Edit: after looking a little closer at the granola, I’m thinking it “is” the quinoa that is hard, and not the seeds…is soaking it enough? It sucked up alot of the water pretty quickly, and I know while it was wet, it may not have been sitting in water all night. Hi Alyssa! The quinoa is crispy whenever I make this, so I wonder if they don’t dry out/crisp up enough in the oven? That’s what I’m wondering… if I do it again, I’ll try my dehydrator! 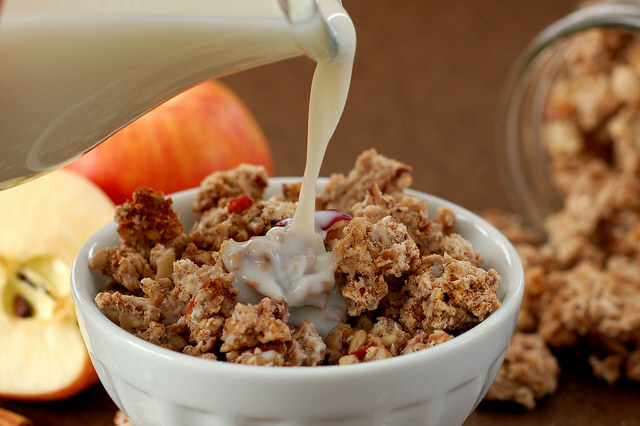 Love how you use natural fruit for healthy granola. The summer is coming so I’ll definitely be making this recipe !